One day mid-July I was chatting with a good developer friend of mine, and he mentioned he'd quickly whipped up the engine for a SameGame clone, and that he wanted to work with me on it. I was interested, I'd never heard of SameGame before, and wondered how he wrote the tile-based engine. I made some quick graphics in Photoshop and set to work making his engine look like an iPhone application. We worked on it for a couple weeks together, but eventually he lost interest due to other pressures and work-related issues, so I was allowed do what I wanted with the code. I played around, rewrote bits, and kept it exercised! In the meanwhile, I sorely missed the old 'Lights Off' from the days before the App Store when iPhone was still a new platform. Lucas (the original programmer) had been hired by Apple, and I figured that would be the end of it; no more development. 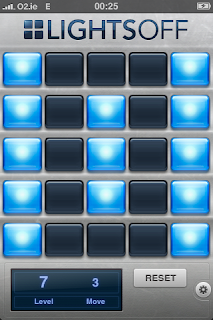 Inspired, I looked back at the SameGame engine and realized that I could adapt this and make a new version of Lights Off! Within hours I had made a demonstrable semi-working clone of the original, so I e-mailed Lucas and Adam Betts (the original artist) about it, with a copy of the app. Lucas, unfortunately, wasn't too interested, but Adam was really excited about working on my version, a 'V2' as it were. Adam worked with me for months creating artwork for the game, while I laboured at the code. Eventually, I reached a point where the original engine wouldn't cut it, and I rewrote it all using Core Animation layers. 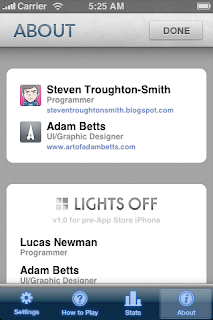 Adam came back with some awesome-looking mockups, with a rich settings UI with a custom-looking Tab Bar. Concept Art: I had no idea how easy it would be to make it a reality, or even if it was possible within the SDK guidelines, but I promised myself I'd get as close as I could. Both of us had University get in the way, and the months rolled by without me getting anywhere near a release, writing and rewriting everything over and over as I learned new tricks and tried to optimize performance. 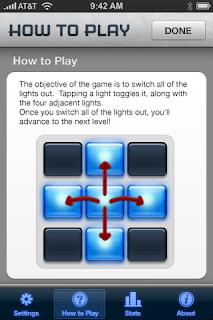 I managed to write up Speed in a day or so, mainly to test the App Store procedures and figure out how everything worked so that I would be better prepared for the release of Lights Off. As Speed grew popular, and I submitted my contracts to allow me to sell items on the Store, I realized that I still had SameGame lying dormant on my hard disk. Realizing my mistake, I submitted SameGame to the store to see how it fared (SameGame is currently making up 13.6% of my revenue). Now, finally, an embarrassing 175 days after I started coding Lights Off, I have called time on the first release and submitted it to the App Store. I did have to shelve some features until the next update (or else I never would have finished it), but I'm confident it's a great game as-is. That it will get even better in the very near future is immaterial. 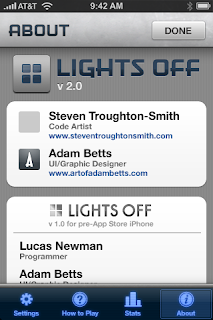 Lights Off will be available in all territories for the low price of $1.99 (€1.59 or £1.19) as soon as Apple approve it, and requires iPhone OS 2.2. Thanks to everyone who's been waiting, especially Adam, and I hope you like it! P.S. SameGame is going to get a massive upgrade very soon incorporating the new engine from Lights Off and some killer additions. I can't wait to show you! Congrats Steven! It looks absolutely amazing.